Rhonda Howard of Philadelphia, who was Marvin Caddell’s sister, speaks in his Middletown apartment on Monday. Nightflower Staats was her sister-in-law, and Joaquim Caddell was her nephew. In this 2003 photo, Marvin Caddell and Nightflower Staats hold newborn Malani Wilson, who is Rhonda Howard's daughter. Bibles on the coffee table was one of the first things Rhonda Howard noticed when she walked into the third-floor apartment where her brother Marvin Caddell had lived at 134 S. Union St. in Middletown. At least five Bibles were sitting there, maybe more. Reading glasses sat nearby. On the same table was a journal where Caddell had hand-written an entry in blue ink. He wrote of uncertainty over the future of his relationship with his wife, Nightflower Staats, from whom Caddell was separated. He wrote of reaching out to God. The entry was from October. No others follow. Howard also noticed that Caddell had installed five security cameras in the two-bedroom apartment not much larger than a two-car garage. One of the cameras was pointed into the bedroom of Joaquim, the 7-year-old son of Marvin and Nightflower. Rhonda, who lives in Philadelphia where Marvin is originally from, came to Middletown with a U-Haul on Monday to remove Marvin’s belongings from inside the apartment — where, Middletown police say, Marvin shot and killed his wife and son Wednesday, Jan. 2, before turning the gun on himself in an apparent murder-suicide. Their bodies were not discovered until Jan. 5, after a local pastor who had gotten to know Marvin and his family through Wesley United Methodist Church on Ann Street requested police go to the apartment for a welfare check, because the pastor had not seen them for several days. Outside of some residue from police tape on the door, there was little evidence of what happened in the apartment that day. A vigil service was held Jan. 9 at 134 S. Union St., Middletown, for victims in last week's double murder-homicide. 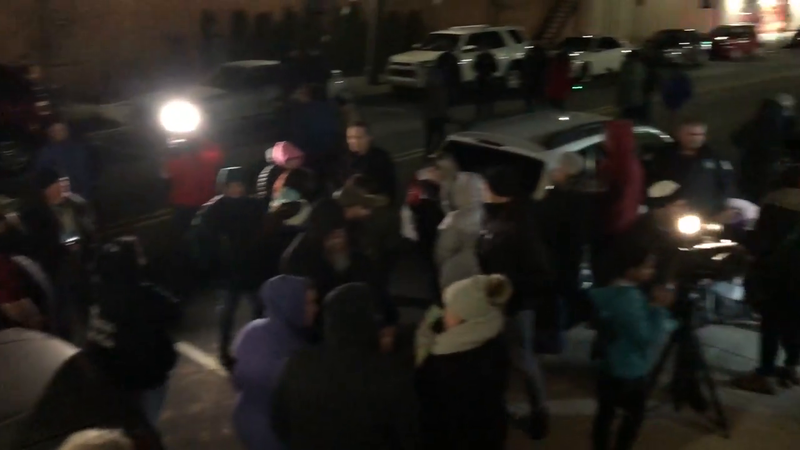 People stayed afterward to eat chili and drink hot chocolate, and to talk with one another. Howard said she doesn’t understand what led Marvin to kill his wife and his son. But she said Marvin is not the “monster” that some are making him out to be, such as on social media posts. She said he was a devoted father, who had spent every day with his son since the day Joaquim was born, Rhonda said. Rhonda had last spoken to Marvin over the phone in early December. Marvin didn’t sound as good as when Rhonda had talked to him in November. Then, he talked of the problems he was having with Nightflower, but he seemed philosophical about it — saying if it doesn’t work out, it doesn’t work out. He had started a job at a local grocery store. He had started the process of enrolling Joaquim in Middletown Area School District. He was active in the Wesley church, even helping give away turkeys to needy families over the holidays. But during that last conversation in December, Rhonda detected that things had become strained. She and Marvin didn’t argue, but he hung up on her. That was the last time Rhonda ever heard Marvin’s voice. The next she heard of her brother came from a pink slip she got in her mail at home from the 15th District of the Philadelphia Police Department. The police gave her a phone number to call a detective with the Middletown Police Department. Rhonda is a year younger than Marvin. On Sunday, while preparing for her drive to Middletown, she and her family celebrated in Philadelphia what would have been Marvin’s 49th birthday. Even though she was younger, Rhonda said she was “stronger” than Marvin, because she was raised in North Philadelphia and grew up on the streets. Marvin grew up in the suburbs and wasn’t a street kid. His biggest worry growing up was somebody stealing his bicycle out of his yard, Rhonda said. She said Marvin wasn’t a fighter or an angry person. She recalls him only ever getting into a fight once, when a guy hit Rhonda in the back of her head with a basketball. But she said Marvin got “caught up” with a group of friends who were doing the wrong thing. In 1994, he was found guilty of robbery and sentenced two to five years in state prison. He was 24, but still a kid, Rhonda said. He had to grow up in prison. It changed him, Rhonda said, and not for better. 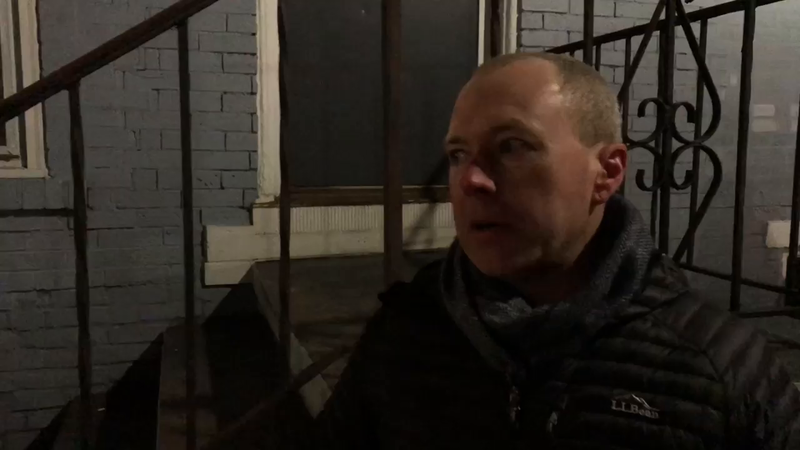 George Crist, who owns the building at 134 S. Union St. in Middletown where a double murder-suicide took place last week, discusses why a vigil was held Jan. 9. About three months after getting out of prison, Marvin came to see Rhonda at her home. She had gotten him a job. She excused herself for a moment to go to the bathroom, and when she came back, Marvin was sobbing uncontrollably. Marvin was living in Rhonda’s basement when Rhonda met a woman named Nightflower, who worked in the same building Rhonda did. Nightflower — whom Rhonda calls by her nickname “Flower” — was from London, Ontario. But according to Rhonda, Flower’s mother had disowned her for falling in love with a black boyfriend. The boyfriend brought her to Philadelphia. One day the boyfriend came in to where Flower worked, dropped off a trash bag and laundry basket full of her clothes, and told her not to come home. Rhonda had an empty bedroom and told Flower she could stay with her. That’s how Marvin and Flower got together, in 2000. They both felt isolated from society for different reasons, Rhonda said — her brother from his years in prison, and Flower from being disowned by her family. That gave them a connection to one another. They married in 2002. Marvin had two children from previous marriages, but wanted a child with Flower. The first two times, Flower had miscarriages. Doctors told her she would never have children. When Joaquim was born in 2011, “he was a miracle baby,” Rhonda said. Flower didn’t have a GED or high school diploma, so Marvin talked her into furthering her education. She got her GED and became certified in a few things. She found work in collections and later in real estate, working with homes under foreclosure. In most of their years together Flower was the breadwinner, Rhonda said. Marvin had a hard time finding steady work because of his conviction. Often when he got a job he would lose it after a short while, sometimes because someone from his past in prison would show up and people would start talking, Rhonda said. Around 2013, Marvin started getting Social Security due to a physical disability. Rhonda doesn’t know exactly when Marvin, Flower and Joaquim moved to Middletown, or exactly why. George Crist, who owns the apartment building where the family lived, told the Press & Journal that the family had lived there for less than a year before the murder-suicide. Rhonda said that Flower separated from Marvin in July. She took Joaquim and moved elsewhere. Nightflower later came back to Middletown with Joaquim — Rhonda doesn’t know if by choice or if Marvin talked her into coming back. But the marital issues remained. Marvin had not yet filed for divorce or for custody of his son, but he had filed paperwork in Dauphin County to start getting child support from Flower, Rhonda said. Nightflower, who didn’t have a record, had also bought a gun and brought it into the apartment, which Rhonda said worried both her and her therapist, who was also Marvin’s therapist. “His therapist talked to him about it and he was like, ‘Marvin, why do you two have this gun? You need to get rid of it.’ (But) you can’t make people listen to you,” Rhonda said. She laughs when she is asked to recall Joaquim. He was sweet, very smart and inquisitive. “He was kind of mature for his age” and was close to Rhonda’s son, Josiah, even though Josiah at 12 was 5 years older. She remembers Joaquim calling Josiah on the phone every night for two and three weeks straight, sometimes as several as four or five times a night. Marvin had not had a good relationship with his own father, and was “overprotective” of Joaquim, Rhonda said. But Rhonda said Marvin wouldn’t lay a hand on Joaquim. “I couldn’t even yell at my nephew without him (Marvin) telling me, ‘I’ll chastise my child — you don’t,’” Rhonda said. To Rhonda, Flower choosing to again leave the apartment, but without taking Joaquim, was proof that Marvin was a good father who would never have meant his child any harm. While Marvin had found work at the grocery store, he had been fired from the job about a month before. He hadn’t been in prison for many years, but Marvin was having fresh trouble with the law. According to public court documents, Caddell was to appear in Dauphin County Court on Jan. 9 on pending charges after being arrested in Susquehanna Township in May for possession of marijuana, use/possession of drug paraphernalia, and driving under suspension. He had also pleaded guilty in Lancaster County Court on March 19 to a misdemeanor charge of theft by unlawful taking. Rhonda had known for years that his brother had mental health issues. His paranoia was such that two years ago, when Marvin’s younger brother died, Marvin didn’t even go to his funeral. Despite signs that Marvin was getting it together — such as from the phone call in November — Rhonda still saw her brother as being too isolated. Today, she says she could have pushed him more about it, but wonders if she would not have just pushed him away. She is convinced that his time in prison was at the root of his troubles, even though it had been years since he had seen the inside of a cell. She compares it to a veteran coming home from a war with PTSD, even if the war was long ago such as Vietnam. If the issues aren’t addressed and treated, it just gets worse and worse until it blows up. She pleads with people today that they learn from what happened to Marvin, Flower and Joaquim. If you know your family is struggling — the way that Marvin and his family were — get them help, while there is still time.